The majority highly appreciated the light weight of the On Cloudflash. Most users mentioned that the shoe was highly comfortable. A few wearers lauded the responsiveness of the Cloudflash especially on concrete surfaces and called it a ‘great racing shoe’. A reviewer thought that the upper was fairly breathable since it allowed a good amount of air circulation through it, thereby keeping his feet cool and the rides fun. A few purchasers expressed admiration for the colors and the overall look of the shoe by calling it ‘pretty’. A runner intended to use these shoes for his upcoming marathon race owing to its great all-around features. Several runners labeled this running shoe’s price as expensive. With its unbelievably light mesh material, impressively soft yet responsive build, and an eye-catching look, this running shoe has won the hearts of millions of customers worldwide. While the shoe may be expensive for some individuals, its unparalleled qualities make it a worthwhile choice. The On Cloudflash has certainly become the topmost choice of many professional runners. The On Running Cloudflash is a lightweight racer. Weighing at 220g (7.7oz) with a 5mm heel-to-toe drop, Cloudflash is the fastest On shoe ever. The cushioned and responsive yet lightweight package ensures that your PBs will be broken in a flash. It retails at whopping $180.00 on running warehouse. The price may leave a dent in your wallet, but you’ll be willing to fork out every penny once you hear about the ground-breaking technology of the Cloudflash. The Cloudflash by On Running is the Product Of The Year of ISPO AWARD 2017 in the performance segment. It is described as a well executed, clean and coherent design with attention to detail, resulting in an extremely credible high-performance product. One can guarantee the superiority of a product when it wins an award even before public release. Additionally, the Cloudflash has made the podium in the both the 2016 Rio Olympic Games and the ITU World Triathlon Series Abu Dhabi 2017. The Cloudflash is also tremendously popular with Japanese community. The Japanese community is known to be very particular in the selection of their shoes. On Running has thrived in the Japanese market due to the unparalleled construction of their shoes, as observed from various social media platforms. The Cloudflash is no exception; it was quickly snapped up by many Japanese Consumers upon its release. The Upper plans to “deliver everything with nothing” with an ultra-thin white Nano-mesh supported by a yellow exoskeletal structure. The Nano-mesh ensures maximum breathability and mild water-proofing properties. The mesh is complimented by the strategically placed skeletal structure overlays that extend to the front of the shoe, making up the structure of the Upper. I vastly enjoyed the breathability of the Upper, having run a couple of 5km runs barefoot without any hot-spots. The Upper’s resistance to water was also greatly appreciated. The shoe stayed dry despite running into a couple of puddles after a heavy rain. The Upper is reminiscent of Nike flyknit, the only difference being that the Nano-mesh provides considerably more structure than the latter. This results in minimal lateral movement of one’s feet within the shoe, which is, without a doubt, a plus point for me. Adding on to the stability of the shoe is the performance heel-cup that hugs the heel for a snug, “race-car” like fit. It keeps the feet secured and locked down, but is cut at the ankle to offer fluid movement of the foot similar to track spikes. My feet felt unrestricted and could move in all directions without difficulty. The low-cut of the ankle collar may pose a concern for lateral stability for over-pronators. For neutral runners, this can be overlooked. The Cloudflash offers an option for ankle-lock lacing by providing additional eyelets for runners who want to feel additional security in their shoes. I used the ankle-lock lacing to further secure my foot to the shoe, due to the slight incompatibility in size of my foot and the shoe (sizing mentioned below). Reinforced eyelets are present on the Cloudflash. Most eyelets are surrounded with the “exoskeletal” overlays while the top two eyelets feature metal grommets. These reinforcements prevent any fraying of the upper, prolonging the durability of the shoe. The Cloudflash features overly long and thin laces, something I dislike about all On Running shoes. The laces looked awkwardly long, despite bring threaded through the additional eyelets. The laces also seemed to come undone every few kilometers when I tied it with a single knot. Despite my best efforts to tighten the laces with a single-knot, I had to resort to double-knot lacing to ensure that the laces stayed in place. The thin laces also implied that more pressure would be applied to the top of the foot. However, the excellent construction of the tongue prevented that from happening. The tongue was thin but protective enough to distribute the pressure caused by the thin lacing. My feet did not feel strangled even when lacing the shoes tightly. The material of the tongue was gentle in the way that it did not cause any irritation of my foot. I could run barefoot without encountering any issues. The tongues of several shoes fold up as the miles build during the run. This was not the case for the Cloudflash. The tongue stayed in place throughout runs and conformed nicely to the shape of my foot. The Cloudflash is narrow but wide enough to accommodate my foot, just enough for toe splay. Wider-footed runners are NOT recommended to size up half-a-size. In fact, the shoes run a half-size small. I purchased my Cloudflash in US 9.5 but there was too much space in front of the toes. I really liked the design of the shoe. On Running managed to make a running shoe that is meant to go fast, to look equally as fast. I really like the narrow and sleek design of the Cloudflash. A small lightning bolt at the front of the shoe added to the quick look of the shoe. Furthermore, the sleek midsole design complemented the swift-looking upper. The 14 Cloud elements below the Cloudflash are shaped to "transform and transfer more impact energy from the runner into fast, forward momentum." For those new to the brand, cloud elements are rubber pods with their midsection cut out to allow dampening of impact upon landing. On Running claims that you would achieve a "cushioned landing, explosive take-off". The cloud elements did a good job in reducing the impact, despite the shoe having no real midsole. After a sprint triathlon, my legs did not feel as beat up as it would with other racing flats. The Cloudflash also features a Pebax Speedboard. Pebax is a material known for its flexibility and energy returning properties. This translates to optimum energy transfer from initial impact to toe-off. Thanks to the speedboard, the ride was snappy yet flexible, a commendable feat achieved by On Running. Usually, a shoe is either stiff and snappy or flexible but lacking 'toe-spring'. With the Cloudflash, you get the best of both worlds. An innovative hybrid sock liner gives extra comfort and cushioning. I wished that the foam in the sock liner was denser; the forefoot was way too sof that it compressed fully just by standing in it. I was not sure if it provided any additional impact-reduction at fast speeds. However, the cushioning of the Cloudflash is more forgiving compared to a racer of a similar build. Overall, the ride was an enjoyable one, especially when i ran at below 3:50/km (6:10/mi). CloudTec rubber patches are placed on the front six and back two Cloud pods. This helps with traction and durability of the Cloudflash. A note to remember is that the Cloudflash has a similar durability to racers of the same class. This means that the estimated lifespan would be averaging 500km (310mi). Traction posed a problem for me. The rubber patches, despite providing additional grip, can be slippery on wet roads and more so on wet tracks. While performance was not vastly affected when running at aerobic interval intensity, I felt uneasy while doing speed work as I would slip ever so often. The Cloudflash excels on the road and track. It is best used for speed work to races of up to 10km. The Cloud feels better at tempo speeds while the more responsive Cloudflash excels when you pick up the pace. I would unquestionably pick the Cloudflash over The Cloud for racing. Both provide a fast and responsive ride. What sets the Cloudflash apart from the Adios Boost 3 is the Cloudflash’s superior quality of the upper. The upper of the Cloudflash feels less abrasive compared to the rougher spacer mesh material of the Adios. Additionally, the Cloudflash has an equally snappy ride but is far more flexible than the Adios. The only advantage of the Adios is a more cushioned rear-foot. Cloudflash for races of 5-10km, Adios for any distance beyond 10km. The Cloudflash is more comfortable and responsive than the Hitogami 3. If you are on a budget and want a longer-lasting racer, go for the Hitogami. If not, go for the Cloudflash. Want a new Personal Best? The Cloudflash promises your success in a lightweight and extremely responsive package. The On Cloudflash boasts the ‘Speedboard’ technology for high cushioning and an efficient energy return. It consists of the lightweight Pebax layer which has the capability of bending flexibly according to the runner’s needs, dispersing impact loads and providing a very effective buffer system for a comfortable yet responsive ride. The Low Abrasion rubber pads are placed at strategic locations on the outsole for maximum traction and higher resistance to abrasion. The innovative ‘Cloudtec’ construction in the midsole offers the much popular ‘springiness’ in the shoe for a fun yet efficient ride. It is composed of tiny compressed balls, which provide the push needed for propelling forward and the support needed while landing, thereby preventing strain on back or legs and ensuring a healthy ride for the user. The shoe’s upper features the Nanomesh technology which provides optimal breathability and lightest possible weight for an efficient performance on the roads. The Exoskeleton, a lightweight structure specific to the shape of the foot, adds the needed structure to the On Cloudflash. The Heel Cap in the back region of the shoe holds the heel in its proper position while running, thereby preventing uncomfortable sliding of the foot inside the shoe. The On Cloudflash fits true to size. It comes in the standard running length for both men and women and has the standard medium width of D for men and B for women respectively. Its stretchy and adaptive upper makes the shoe suitable for runners with wide feet as well. The shoe features the ‘Speedboard’ in its outsole. According to On, the Speedboard consists of four layers and each layer serves a different purpose for the runner. The first layer enhances the shoe’s flexibility for a better landing; the second layer evenly distributes the effect of impact forces over the whole surface area; the third layer avoids the damage due to torsion, but does not limit the foot movements; and the fourth layer, the transversal grid, promotes natural gait for the runner respectively. Together, these layers deliver a combination of unparalleled comfort, excellent flexibility, and remarkable adaptability. The lightweight yet well-cushioned Pebax platform provides a plush yet responsive ride to the runners. The Low Abrasion rubber pads that are placed strategically in high impact zones prevent the risk of injury to the runner’s foot by ensuring the needed protection against the concentrated loads and by very increasing the shoe’s durability. The Cloudtec Elements in the midsole are tiny fully compressed ball-like structures which help in a solid push off the ground, thereby giving the much desired ‘springy’ feel in the midsole and reducing the impact of harsh pavements which road runners like to run upon. These elements add bounce to every step of the ride and distribute the impact forces evenly during the landing phase. 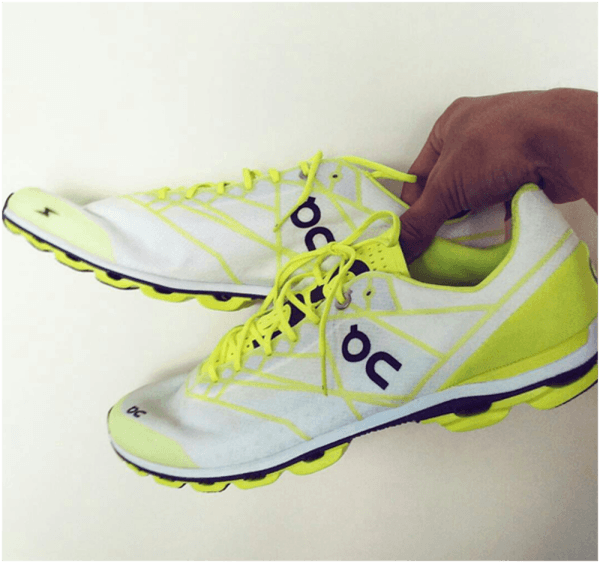 The CloudTec is also integrated into the midsole of the On Cloud shoes and other running shoes from ON. The Nanomesh technology results in an effectively thin upper capable of shredding moisture efficiently and maintaining a comfortably cool and dry environment inside the shoe. The Exoskeleton, a lightweight metatarsal-specific design, adds structure to the upper to prevent its bulking and increases security for the runner’s foot. The On Cloudflash houses a Heel Cap in its rear region, which keeps the heel locked down in its proper position, thereby providing the snug fit at any point or speed during the run.